Roast a few marshmallows, enjoy the smell of your campfire, admire the stars, and nestle inside your sleeping bag. 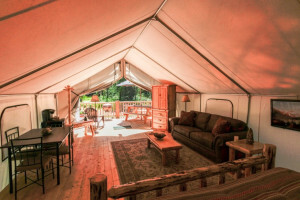 Whitefish Campgrounds are one of the best ways to enjoy Montana’s natural attractions. 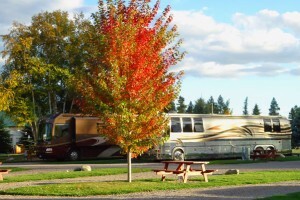 Spotless campground & RV Park. Full-hookup options w/premium channels. Well landscaped, close to Flathead River & Lake, 20 mins to Glacier Park. RV supplies & Meat Shop. Book your favorite Flathead National Forest campground location ONLINE and save. 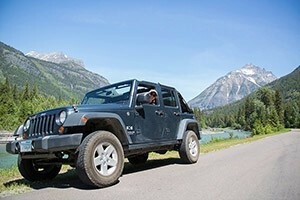 Good for small RVs, trailers, tent campers & tent sites, many within minutes of Glacier Park. When camping doesn't work out, we're a great resource in Bigfork. Quality and comfortable motel rooms, pet friendly, and with on-site pool. Where can I find great campsites near Whitefish? Take a short walk from your campsite to enjoy a swim in Whitefish Lake. 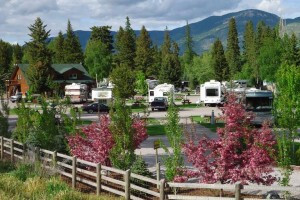 Campsites at Whitefish State Park are nicely spaced for privacy and the recreation area features a swimming area, picnic area, grills and bathrooms. Location: Located 1-mile north of Whitefish on 93 north. Cost: Peak season prices $14 to $28. 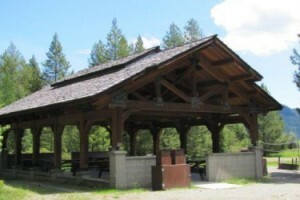 Managed by the Glacier View Ranger Station of the Flathead National Forest Service, Moose Lake Campground is located in a remote setting and offers peaceful and primitive camping. Enjoy the peaceful setting of 3 primitive campsites situated on remote Sylvia Lake. Restrooms are available, but there’s no potable water. This is a popular spot for fishing cutthroat trout. Location: Located 33 miles from Whitefish. Take Highway 93 northwest out of Whitefish, Montana. Turn onto Farm to Market Road. Turn off Farm to Market Road onto Star Meadows Road (Forest Service Road 539). Take this road to Forest Service Road 113 that turns into FS Rd #538B go 3.5 miles look for the campground site sign. Signs mark the way to Sylvia Lake at most intersections along the route. Overlooking the Hungry Horse Reservoir, Lakeview Campground offers waterfront views and the best location to roll out of your tent and catch a jumbo lake trout at dawn. Location: From Hungry Horse follow Forest Road 895 for 24 miles. With sweeping views of the Swan Range, the 400 acre Holland Lake is very popular, so don’t expect serenity here. Due to its many location, convenient day-use area and services, it is heavily trafficked. Location: Head south of Condon on Montana Highway 83 approximately nine miles to Holland Lake Road. Services: Boat launch, toilets and potable water. 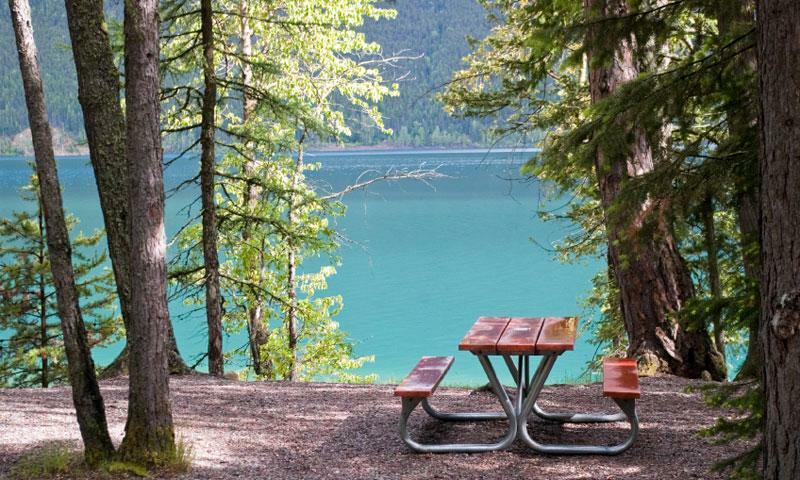 In one of the most pristine areas of Glacier Park, Bowman Lake Campground is 32 miles north of the West Glacier gate. If you are looking for a more serene setting to your pitch your tent or just want to wake up early and catch a few fish, check out one of Bowman Lake’s 48-sites.